It’s a cold day here in Wisconsin, so I am letting my mind wander to the hot days of summer. I wonder about living in the post Victorian era in Chicago with a hot summer like we had this year and what would I do to cool off? I know in my great grandfather’s case, Elijah Fordyce Stone, he sent his family up north along the eastern shore of Lake Michigan to Ludington. 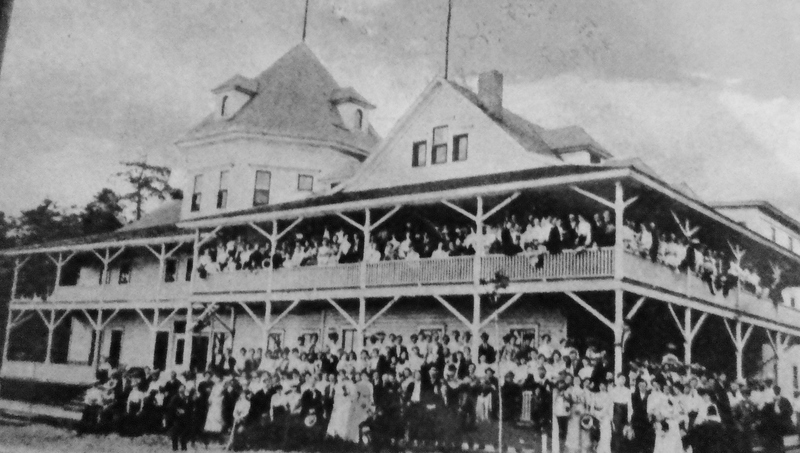 Located north of Ludington was a Methodist summer resort and assembly known as Epworth. By the time I found out about this, the primary people were long dead. My father and his cousins,and the Fordyce Stone children, would have been too young, if born at all, to remember details, unfortunately. Growing up in northwest Michigan, church based summer communities are still very common. On the west end of Crystal Lake in Benzie County, is the Congregational Assembly. ( When I was a teenager, it was popular to go to “the assembly” mid week for their dances and rub elbows with other locals and kids from far away.) On the south shore of Crystal was the Christian Assembly. All of these cottages, like those at the Congregational Assembly, were family owned and passed down from generation to generation. Relatives would float in and out during the summer months for visits and to cool off in the deep wooded community that lined the shore of Crystal Lake . Well, my great grandparents did the same, only they did not come up north as far as Beulah. In their case, they came to Ludington and Epworth which was a Methodist Chautauqua style educational family camp. In the early years of its formation (the late 1890’s), families actually camped in tents but as the experience became very popular across America, the living arrangements and programming changed. Originally the idea was more spiritual in nature, but quickly became cultural as well. The assembly would bring in entertainers, teachers, musicians, speakers, and preachers for Epworth as well as the Ludington community. Over time to keep the camp going it was decided to lease land to interested parties to built summer homes. The community grew to over 200 homes. Of course, not just anyone could build on the assembly owned leased lots and if renting a cottage was desired a family had to have 3 references. 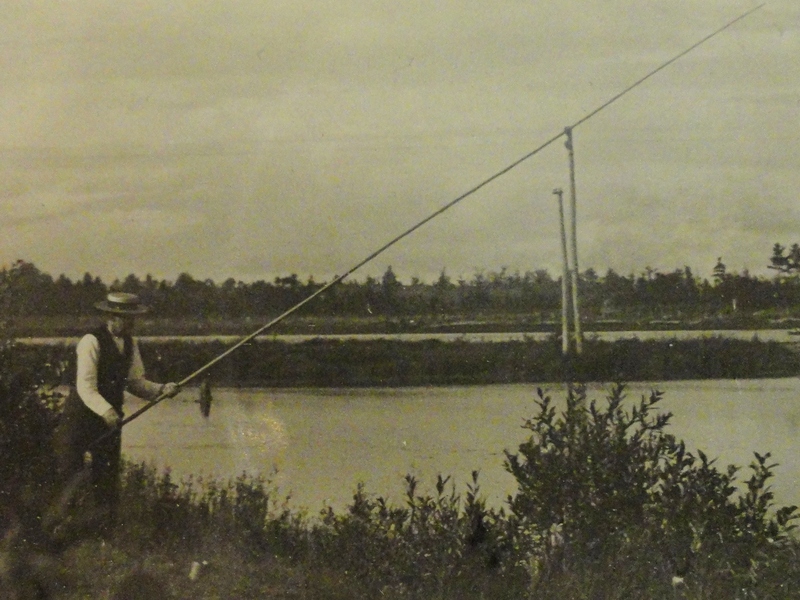 None of the homes in the early 1900’s were winterized, so the camp was active only during the summer. The homes still remain nestled in between and atop the rolling wooded hills bordering the two lakes. The hotel still exists, but more as a museum. 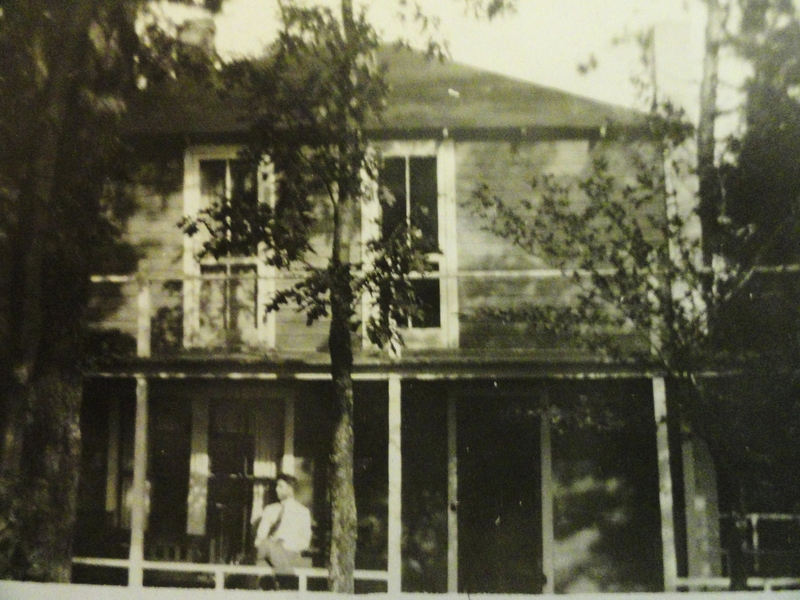 Stoney Point was the “original” name for the Elijah Stone family cottage. I don’t believe they spent more than twenty summers there, if that. More about that later. Epworth’s summer residents were mostly from Chicago, St. Louis, Kansas City, and Little Rock, AR. These summer assemblies more often than not had railroads promoting them because families would travel by rail to the closest point or by steamer. 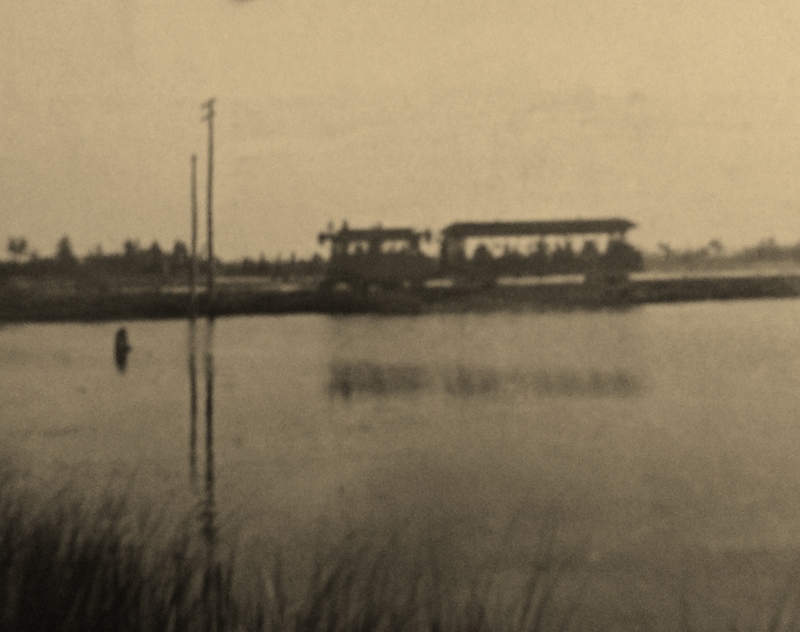 In Ludington, the families would then depart for Epworth on a small steam locomotive train with a single passenger car, called the Dummy Train which covered the last 2 miles of the trip. It operated during the summer, transporting people between Ludington and Epworth. So how did the Stones pass time here at Epworth? 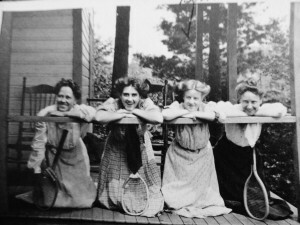 Pictures show my great Aunt Bernice photographed on a porch with chums all holding tennis racquets. 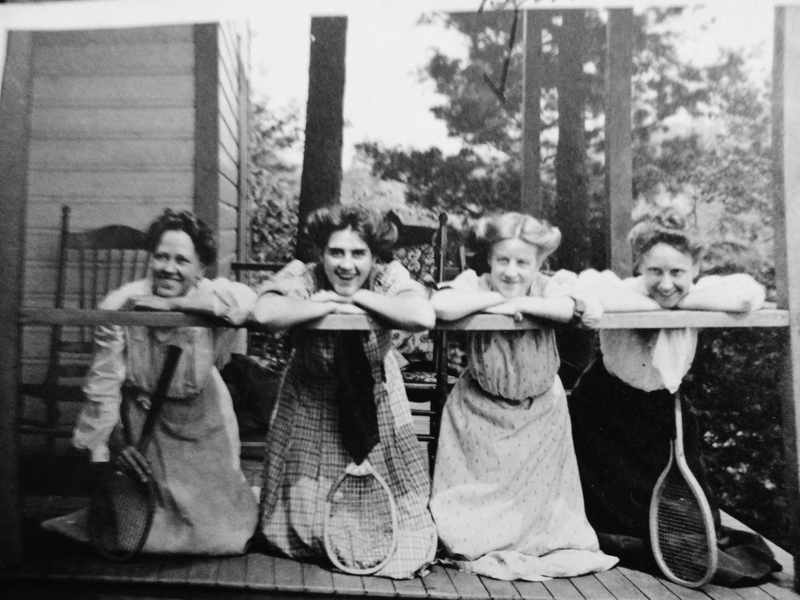 The tennis costumes of the day were often long skirts and billowing blouses for women and white shirts and long white pants for men. 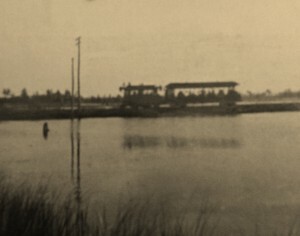 Epworth had Lake Michigan to the west and Lincoln Lake to the east. 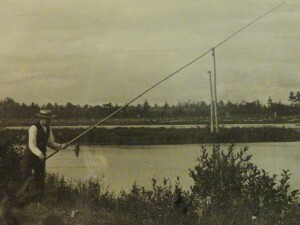 I have a picture of ‘Lidge (Elijah) fishing with a long cane pole in a white shirt and vest, a straw hat, and a cigar wedged in the corner of his mouth, off the shore of Lincoln Lake for pan fish. Another picture proudly displays a whole string of larger fish stretched across the porch. Elijah and his two sons had the good fortune to catch these and the fillets would likely find their way to the evening supper table. My great Aunt Bernice had musical talent and studied opera. No doubt she was able to further her studies or use her talent during the summer. She never married and ended her time on earth on the east shore of Crystal Lake in the village of Beulah. The family stories were that her parents did not approve of a serious suitor in her youth, and she never again had another. Now one of my questions was why Elijah Stone, his wife Sarah, and Bernice did not live out their lives in Ludington or Chicago. Family stories say that they lost the cottage at Epworth and their home in Chicago around the time of the 1929 crash of the stock market. During the 1920’s more middle-class and lay citizens began investing in the stock market. Buying on margin was very popular. Margins were generally around 50% at the time. So a man like my great grandfather could give his broker only 50% of the value of the stocks he wanted to purchase and the broker would put up the rest of the money. This was good if the stock value increase and not so good if the stock took a dive. This kind of investing, likely help fuel the crash of 1929. Well, Elijah was such an investor and he personally experienced financial loss. So around that time he, his wife, and daughter came north to Beulah, MI where both of their sons were living. Wright, the youngest son, was a fruit grower and the eldest son, Fordyce, was a country doctor in Beulah area. It was there in Beulah that in 1938 Sarah died and Elijah and Bernice lived out their lives. Elijah kept a daily diary noting weather and a brief account of each day’s activities. It was often noted that he enjoyed riding with Dr. Ford Stone out to homes with ailing patients. He was also mechanically inclined and would roll up his sleeves and help his son Wright on projects that required mechanical expertise on the farm. Elijah died in 1946 and his daughter Bernice in 1961. I have since sought out Stony Point in Epworth, but the name has been changed. Epworth is currently a gated community with recreational offerings of a golf course, tennis courts, and other facilities. I did get permission to enter this community to go to the hotel museum a few years ago, but found that it was closed. 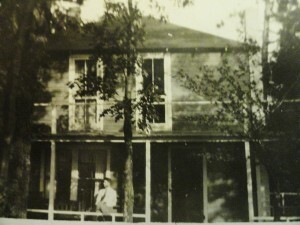 To this day, the property under each cottage is still owned by the assembly and leased to each cottage owner. And likely you must still have good references to live there. The value of the cottages has sky rocketed along with other shoreline properties. So only the very affluent could think of living or renting in Epworth,now. I am looking forward to another summer and another trip to Ludington to bring closure to this story with any further pieces to the story.